In the days of hand tattooing, a tattooist could carry his tools in his vest pocket and work almost anywhere. As soon as the electric tattooing machine hit the market everything changed. The limitations of the electrical cord were immediately obvious. 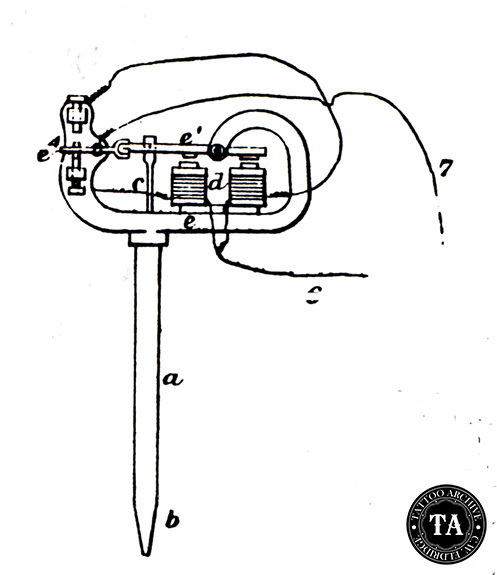 In Edison's 1875 English patent he described this cord as the "flexible connection." 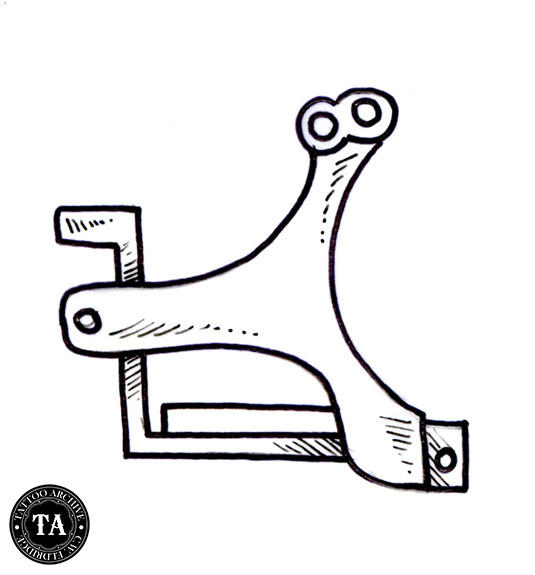 In that patent, his autographic printer was shown with the lath turned and threaded fittings to make that "flexible connection" easier. Samuel O'Reilly's patented tattooing machine in 1891, and Charlie Wagner's machine in 1904, both relied on the same style electrical connectors. With this style of machine, connector problems arose because of the wear and tear on the single strand of bare wire that would have to be wrapped around the threaded connector. As a result of its bending back and forth, the wire would break, the insulation would need to be striped away and the bare wire reconnected. By 1929, the time that Percy Waters' machine patent was accepted by the US Patent Office, connections had been improved by the use of cloth covered phone cords. These cords were constructed using multi-strand flexible wire protected by woven cotton covering. On the ends, metal fittings were placed into special drilled connector posts on the machine. In the tattoo business these cords were referred to as "connecting cords". Waters described them as, "factory made, 36 inches long, 50¢ each or 5 for $2.00." These cords worked well. It was during this period that a tattooist had a machine for outlining as well as a shader for each different color. Each machine would stay connected to the switchboard. As the color palette grew, so did the number of machines and the number of cords on the work stand. It is unclear who first came up with the idea of the clip connecting cord. In the 1940s, Milton Zeis was the first supplier to promote and sell machines that were set up for their use. Zeis' original clip connecting cord was a plastic clothespin that was drilled for L-shaped metal tabs and connected to the back or side of the frame. The clip connecting cord was adopted quickly within the tattoo world. The advancement of the clip cord not only changed the look of the work stand, but the frame design of the machine itself. The large back binding posts were no longer needed. A small hole drilled underneath the back spring mount and a short simple binding post mounted low on the back of the frame was all that was required. Because of this breakthrough tattooists started working with just two machines; a liner and a shader. Generally the clip cord alignment is vertical to the frame and coils, but a few frame builders, like Nick Melroy and Lionel Titchener experimented with frame designs that placed the clip cord horizontal to the frame and coils. This idea, although good, has yet to catch on with mainstream machine builders. 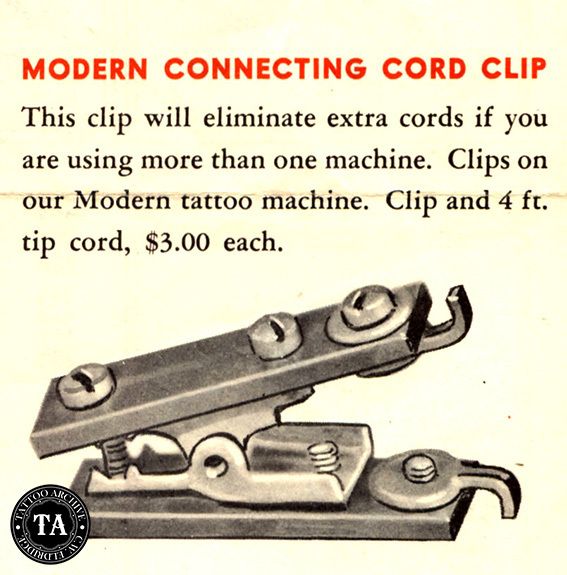 The clip cord idea was not very old before tattooists started experimenting with getting rid of it. Bill Moore was one of the first suppliers to promote the use of the phone plug. 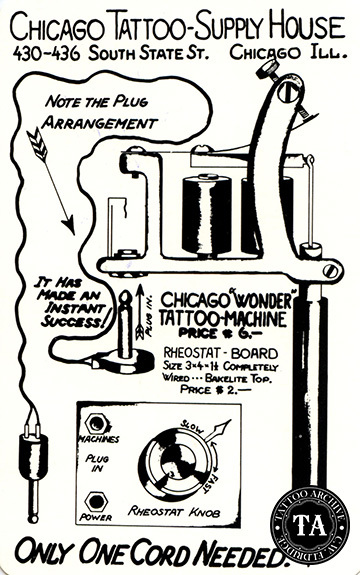 In his 1950's flyer from the Chicago Tattoo Supply House he promoted his "Wonder Machine" which featured "a one cord plug arrangement." Since these Wonder machines were a rarity, it would probably be safe to say the one cord plug arrangement was not a big hit. In today's modern tattoo world, the plug arrangement is back in vogue. Some machine builders, like Lyle Tuttle, have favored the plug set-up for many years, with more folks coming on board. However the majority of tattooists still work with clip cords.